Step 1 Heat oven to 200C/fan 180C/gas 6. Scatter the veg over a couple of baking trays, drizzle with half the oil, season, then rub the oil over the veg with your hands to coat. Roast for 30 mins until tender and beginning to brown. Step 2 Meanwhile, fry the spices in the remaining oil for 1 min – they should sizzle and start to smell aromatic. Tip in the tomatoes, apricots, honey and a can of water. Simmer for 5 mins until the sauce is slightly reduced and the apricots plump, then stir in the veg and some seasoning. 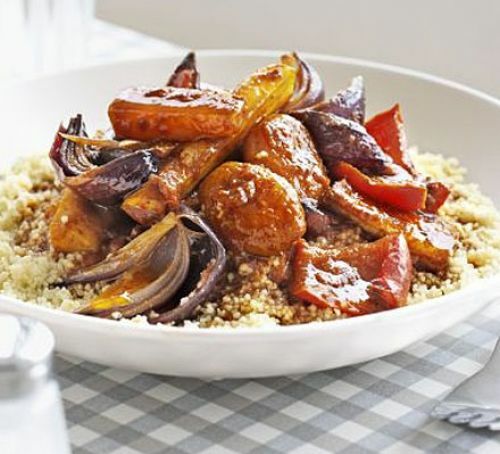 Serve with couscous or jacket potatoes. Give this Moroccan one pot some extra time. Mix the vegetables, oil, spices, tomatoes, apricots and honey in your slow cooker, cover and cook on Low for 6-8 hours until the veg is tender.